Paper Type: We know you may gravitate toward using copy paper or any type of cardstock when you are colouring, but really the best type of paper for alcohol markers will be one that is not porous and has a smooth surface. You want to avoid using paper that will absorb the alcohol ink too quickly. 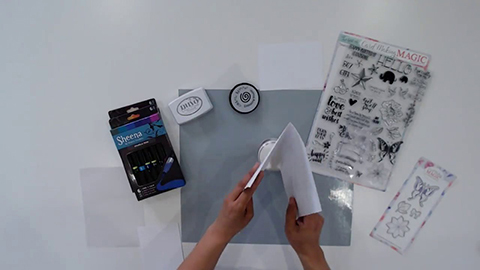 We recommend using the Crafter’s Companion Spectrum Noir 9×12 Premium Marker Paper Pad. It’s smooth and the quality is amazing. Plus it’s really easy to blend your colours seamlessly with this paper. 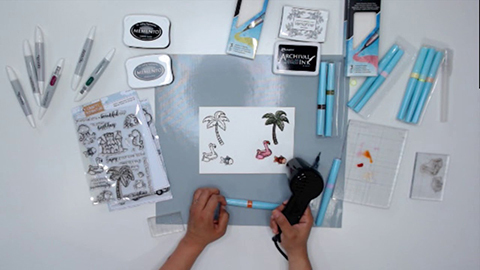 Stamp Ink: Make sure you’re using the right stamp ink for alcohol markers. Otherwise you will get unsightly black smudges or stain your pen tips. We love Tsukineko Memento Ink Pad in Tuxedo Black. Perhaps you think because a stamp ink is permanent, that it won’t smudge, but there are few inks that work with these types of unique markers. Another great alternative is Nuvo by Tonic Studios Hybrid Ink Pad in Black Shadow. Swatch Your Colours: It’s best to begin with swatching your colours on a piece of card that matches the card you will use. This way you can see what colours are lighter and which are darker. The Spectrum Noir colouring system is fantastic in that the pens are numbered according to how light or dark they are in their respective colour families. Pens numbered 1 or 2 are lighter in shade than pens numbered 5 and up. This is so helpful when picking your colours to create a seamless blend. We still recommend swatching regardless, especially if you don’t have the full colouring system. You’ll still be able to see which hues are darker and lighter and can pick your colours accordingly. Light Source: When you’re colouring and want a more realistic effect, you need to be mindful of your light source. Where will your light source be coming from? It’s really up to you in the end, but this can be tricky and will take some practice. If you’re having trouble, just remember that the shadow (or darker colours) will always be furthest from the light. Try to colour your image or image sections by remembering this: LIGHT SOURCE: light tone>medium tone>dark tone. Remember the darker colours will be furthest from your light source. Three Colours or Tones are Key: To create a shaded and blended effect, it’s easiest to start with 3 colours or tones in the same colour family. Pick a light tone, a medium tone, and a dark tone. If you don’t have the complete colouring system, no worries, just pick 3 colours that are similar and make sure they differ in shade. Refer to your swatch chart. 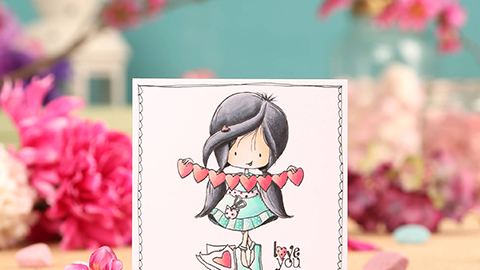 Start by colouring your image completely in the lightest colour or tone. Then pick your darkest tone and colour where the shadows would naturally fall. Then take your mid or medium tone and blend out the line where the darkest tone and lightest tone meet. Finish by going back to your lightest colour and blend where the medium tone and lightest tone meet. Colouring is a lot of going back and forth with your markers to create a seamless blend and realistic shading. Practice is key and with these helpful hints you can build your confidence with these markers. The outcome is gorgeous and well worth the effort! Trust us!